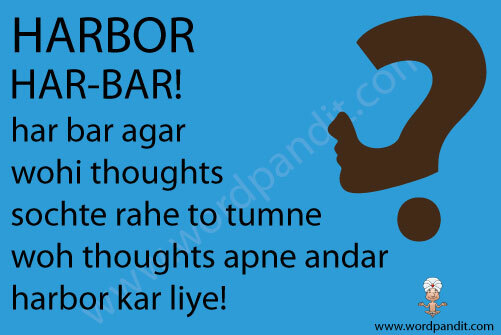 Har bar agar wohi thoughts sochte rahe to tumne woh thoughts apne andar harbor kar liye! Harbor is a part of body of water which is deep enough to anchor a ship(as a noun) or to keep hold of something(as a verb). The word originated before 1150 AD. It was used as herebeorg in old English and herber in Middle English. 3. To hold or keep in mind. 1. The Japanese air fighters bombarded the Pearl Harbor resulting in a huge setback to the American Navy. 2. Harbor terrorists and you become one of them. 3. Do not harbor any negative thoughts if you want to live peacefully.